Enabling instant, decentralized portfolio purchasing. Coinplan, a premier cryptocurrency portfolio marketplace, is delighted to announce the integration of the KyberWidget. By integrating the KyberWidget, Coinplan is providing users the option to purchase portfolios in over 70 different ERC20 tokens. Kyber Network is working on enabling decentralized token swaps to happen in as many convenient interfaces as possible. This token swap capability is currently integrated and used by popular wallets including MyEtherWallet, Coinbase Wallet, imToken, and Trust Wallet. The Coinplan Team is on a mission to make purchasing, liquidating, and managing digital assets simple and effortless. This has pushed them to acquire as much feedback as possible to rapidly expand their token offerings and build features that users actually want and use. Coinplan BASIC is free to use, however, they also offer a PRO membership that gives users access to exclusive features and portfolios. Specify the amount to purchase. Choose a token pair to make the transaction. Confirm and broadcast the transaction. Kyber has done an incredible job making transactions seamless and secure without compromising the user experience, the key element to this integration. Once the token pair and the amount to exchange are specified, the user just needs to unlock their wallet to approve the transaction. With the KyberWidget, users can confidently exchange as each transaction is either executed or reverted should the indicated rate become invalid due to changes in market conditions. With this integration, Coinplan is solidifying their commitment and faith in the future of the cryptocurrency and blockchain ecosystem, while expanding its payment options and making it super simple for everyone to get in and out of the crypto markets. The KyberWidget is designed to enable quick transactions of Ethereum and ERC20 tokens on websites, thereby enabling users to execute basic token exchange functions without affecting the user experience of the website. There is no need for users to register prior to using the service, and the widget allows users the flexibility to swap directly from different wallets (e.g. keystore, Trezor, Ledger, private key, and MetaMask). Just fill in the parameters needed, click ‘Get Code’, and copy/paste this in your web application. You can also visit https://developer.kyber.network/docs/WidgetGeneratorGuide/ for a more in-depth guide on the parameter options you can specify. Kyber x Coinplan Pro Membership (CPRO) Giveaway! 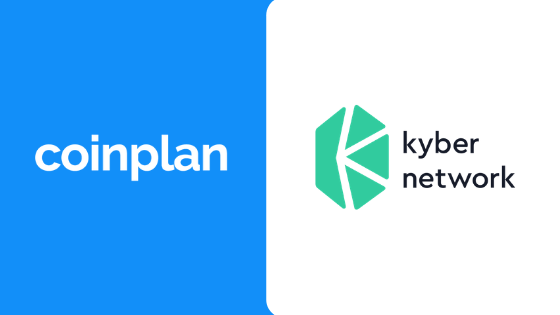 Coinplan has enjoyed working with the Kyber team and seeing their passion alongside their mutual interest to make cryptocurrencies and blockchain simple and seamless drives us even harder. We want to offer supporters of Kyber an exclusive look inside the Coinplan platform by giving away CPRO tokens, native NFT membership-based tokens. These tokens allow users to access the PRO side of Coinplan and will only be available to claim until April 21, 2019. To get yours, email info@coinplan.io with the subject “Kyber Network Rocks” and in the body of the email, please include a non-exchange Ethereum address (MyCrypto, MetaMask, MyEtherWallet, etc.) to receive your tokens. The KyberWidget leverages the Kyber liquidity protocol to allow token swaps in a decentralized manner. Developers can also employ the protocol to enable decentralized payment flows and financial use cases, making tokens usable any time, anywhere. Follow Coinplan on our Website, Twitter, or Medium for the latest updates on our development!